As published on buzzbuzzhome.com on April 16, 2015. On Saturday, April 11th the Minto Westside sales centre opened its doors to the public for a priority preview event. Registrants were offered a first look at the floorplans and exclusive sales incentives — there was even a DJ and food trucks onsite to keep guests’ spirits up while waiting in line. Missed out on the event? Once the crowds cleared, BuzzBuzzHome News got a first-hand look inside the brand new sales centre — take a look. 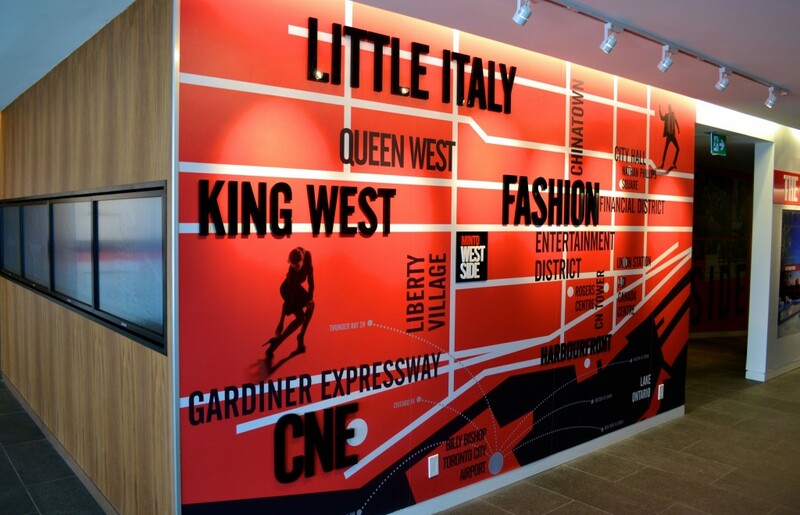 The sales centre is located at 25 Bathurst Street, just steps away from bustling King Street West. The neighbourhood’s allure is unrivalled, with dining, shopping and nightlife attractions. The waterfront is a few blocks away, as is historic Fort York. Plus, getting to and from Westside is easy thanks to the Bathurst and King streetcars. The entrance to the sales centre is marked by a large reception area with chic décor and ample seating. There are tables for prospective buyers to meet with sales reps to view floorplans, which range from studio to three bedrooms. Prices start from the mid $200,000s. Westside will consist of two towers of 18 and 20 storeys, respectively. The 660 unit condominium was designed by Wallman Architects. Its architectural style was inspired by one of Toronto’s original warehouse districts, with oversized windows and high ceilings. The architectural model is currently on display at the sales centre, allowing visitors to understand the full scope of the project. There are two kitchen models on display; however, buyers will be able to choose from many finish options for their new home. The first vignette was clean and modern, with metallic accessories and a light colour palette. The kitchen included white cabinetry, an integrated ceramic glass cooktop and an industrial-style island on wheels. The second vignette incorporated natural wood and matte grey finishes. The kitchen island boasted a Caesarstone countertop with a waterfall edge. The appliances were fully integrated — even the refrigerator was affixed with cabinet panels. The bathroom featured porcelain tile flooring and a frameless glass walk-in shower. Other suite models will include luxurious, deep soaker tubs. Westside will offer first-rate social and recreational amenities. The ground floor will boast over 30,000 square feet of retail space and a welcoming lobby, supervised by a 24/7 concierge. The Westside Club is a central courtyard with a fireplace, bar, lounge seating and water feature. Work up a sweat in the Movement Haus, with TechnoGym equipment, exercise programs and indoor and outdoor yoga studios. The Plunge Social on the ninth floor has a pool, bar and two indoor lounges for dining or mingling with your neighbours. Be sure to visit the Minto Westside sales centre at 25 Bathurst Street, open noon to 7pm Monday to Thursday and from noon to 5pm on weekends.